15% Off Spring Experience Orders at Red Letter Days Make sure to make use of this code while booking with Red letter Days to get 15% off the price of your order! 50% Off Selected Experiences at Red Letter Days-Spa Days, Dining Experiences, Hotel Breaks and More! Enjoy the super offers at Red Letter Days now, and get the perfect gift or experience for yourself. 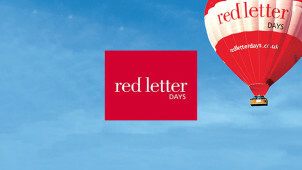 Up to 50% Off Selected Flying Experiences at Red Letter Days Helicopter or hot air balloon ride? whatever takes your fancy Red Letter Days have the perfect experience for you and now up to 50% off. 15% Student Discount at Red Letter Days Whether it's a thrill-seeking gift or something more serene, Red Letter Days have it all! 50% Off Tank Driving Experience at Red Letter Days Find the perfect unique gift experience at Red Letter Days including an amazing deal on Tank Driving, you can save yourself 50% off today! 50% Off Selected Animal Experience Days at Red Letter Days If you're an animal lover, Red Letter Days have the perfect day out for you! Get up to 50% off on scuba diving, meerkat and owl encounters and much more. 2 For 1 Day at The Races at Red Letter Days Save £42 on an action packed day out at the races. 50% Off Selected Attractions and Tours Orders at Red Letter Days Get up to 50% off selected days out at Red Letter Days including Thames Cruise, Beer tasting. and zoo entries! Amazing New In Experiences from £39 at Red Letter Days Including Crystal Maze, Tribute Acts and many more incredible experiences. Red Letter Days deal in gifts to remember. From big thrills to days for escaping, these are more than just your average presents. So if you're looking for a special something to do with your loved one or if you want to treat the family to a fun day out during the holidays - Red Letter Days is where you'll find those priceless experiences. Run by Peter Jones and Theo Paphitis, Red Letter Days bring hundreds of days to life with experiences to please every taste! Buying for thrill lovers and pleasure seekers has never been so easy with the range of choices and speedy ordering service online at RedLetterDays.co.uk. Purchasing online with added flexibility is all part of the service. You can have your gift sent in the iconic red letter gift pack and add your own message should you prefer. Last minute lapses of memory can also be catered for, just send an eVoucher instead or choose next day delivery from their courier provider online. Why not have a browse through the last minute offers and deals too for a double discount on your purchase? You’ll find a great range of late availability at special times and prices which you can buy right up to the wire. Send someone you love on a whirlwind adventure, show them something new and let them experience their dream day out- they’ll never forget it! How do I use my Red Letter Days voucher? You’ll be able to see your savings straight away in the order total! Click ‘Continue’, fill out your payment details and complete the order process normally, enjoying some big savings on great experience days! Take along a friend for free with Red Letter Days 2 for 1 deals. Cheap experiences days just got cheaper for everyone! How does Red Letter Days work? Giving them a day to remember is easy with Red Letter Days. Simply browse their inspiring range of experience day’s to find one which fits their idea of a great day out. Purchase it and have it sent to their address. The lucky receiver will simply register their voucher with Red Letter Days online or by phone upon receipt, and book in their day out on a date and a time that suits them. How is my Red Letters Day gift delivered? This not your average gift voucher. You can be sure your Red Letter Days gift will impress. Your gift will be sent in stunning red presentation envelopes, with a message to add that all important personal touch. Choose your gift pack when you order, and knock their socks off with a standout gift! Do Red Letter Days do Next Day Delivery? Are you scrabbling around for a last minute gift? Relax. Red Letter Days offer a Next Day courier service to make sure your gift arrives in time for the occasion. Alternatively, you can opt for an e-Voucher to be sent directly to their email address to say their gift is n the way. Red Letter Days has been helping you give the gift of experience for over 30 years. Boasting an unrivalled selection of activities and days out to enjoy nationwide, you can be certain this year will be a year to remember! Now you can make the next big occasion a little bit more special with something extraordinary. From spa days for two to the ultimate driving experiences, make sure you browse with a Red Letter Days discount code to hand for great savings on your fun. With a huge range of exhilarating, relaxing, quirky and cool things to do, make another's day one they won't forget in a hurry. The term ‘red-letter day’ originates from the beginning of the 1700s, when people began using the colour red to highlight special days, festivities and events on their calendars. The saying evolved to describe days that can be generalised as exciting and worth remembering. What better name is there for the company that makes every day a ‘red-letter day’?! There is nothing quite as quintessentially British as afternoon tea, and this tradition is still enjoyed by many a sweet-toothed Brit to celebrate special occasions, or simply for a fancy day out. Treat a pal or family member with our afternoon tea offers and your Red Letter Days voucher will see that you pinch a couple of pennies off the price. Get out and explore the country by enjoying perfect sarnies alongside buttery scones with lashings of cream and jam - all washed down with bubbles and your choice of tea - very good day to you!